Idler Sprockets for ANSI roller chain sizes #35 thru #100. Idler sprockets are also referred to as type "BB" sprockets. 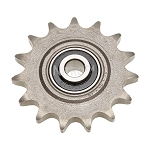 Idler sprockets are commonly used to take up chain slack on drives using long lengths of chain.